Billions of dollars in oil and gas revenues are at stake as Australia continues to bully East Timor out of its undersea energy resources. The outbreak of violent clashes between government forces and disgruntled former military personnel put East Timor,* one of the world's newest nations, into the headlines this spring. East Timor achieved full independence in 2002 after nearly three decades of profoundly destructive occupation at the hands of an American-backed Indonesian military. The events of late May, widely attributed to the firing of about a third of the Timorese army following an unlawful strike by soldiers, and to "communal" strife, have roots in Timor's disastrous recent history and tenuous current circumstances. With even the sparse economic infrastructure that had been built up during Indonesia's occupation largely destroyed by the departing occupation and paramilitary forces in 1999, the country has faced great challenges in its efforts to rebuild and develop. Vast undersea oil and gas fields off Timor's coast could supply critically needed funds for development, but in the last several years Timor has been involved in a bitter fight to get neighboring Australia to recognize its rights to this valuable resource. There are four main oil and gas fields in or near production in the Timor Gap area that are currently at issue (see map); all of them would rightfully belong to Timor under prevailing principles of international maritime law. Nonetheless, Australia, 240 nautical miles across the Timor Sea, continues to try to legitimize its own claim to these resources. By pushing to extend a bilateral treaty framework forged with Indonesia in the 1970s and 1980s onto East Timor, Australia has been able to defer settlement of the most pressing issue—defining a permanent maritime boundary between the two countries—long into a designated future, at which point the oil and gas in the Timor Gap are expected to be exhausted. Vast sums are at stake. Since 1999, for example, Australia has reaped all of the approximately $1 billion in revenues the now nearly exhausted Laminaria-Corallina field has generated; East Timor has received none. Given the weakness of Australia's position, which openly contravenes the global consensus on undersea resources as embodied in the U.N. Convention on the Law of the Sea (UNCLOS), it will be able to prolong the "interim" arrangements of the outdated bilateral treaty framework only as long as Australia continues to reject East Timor's rightful claim to these critical resources. 1600s: Portuguese invade Timor, set up trading post and use island's sandalwood. 1749:	Timor split following battle between Portuguese and Dutch. Portuguese take the eastern half. 1942: Japanese invade. Up to 60,000 East Timorese are killed. Japan in control until 1945. 1973:	Treaties signed in 1971 and 1972 by Australia and Indonesia "Establishing Certain Seabed Boundaries" come into effect. 1975: Greater Sunrise oil and gas field discovered. 1975: August Following 1974 anti-fascist revolt in Portugal, Portuguese administration withdraws to offshore island of Atauro. November: After brief civil war, Fretilin (Revolutionary Front for an Independent East Timor) declares East Timor independent. December: Indonesia invades, using its fight against communism as a pretext. It annexes East Timor as its 27th province, a move not recognised by the U.N. Strong resistance to Indonesian rule followed by repression and famine in which 200,000 people are thought to have died. 1989:	Australia and Indonesia sign the Timor Gap Treaty, which provides for Indonesia-Australia joint exploration in the so-called Zone of Cooperation (ZOC), with revenues shared 50-50. 1991:	November: Santa Cruz cemetery massacre: troops fire on mourners at funeral of an independence supporter in Dili, killing more than 100 people. December: Australia and Indonesia award contracts to Phillips Petroleum, Royal Dutch Shell, Woodside Australian Energy and other companies to develop oil/gas resources in the ZOC. Contracts continue to be awarded throughout the 1990s. 1999:	May Following 1998 resignation of Indonesian President Suharto, Indonesia and Portugal sign agreement to allow East Timorese to vote on their future. Deal endorsed by U.N.
Aug-Dec: Almost 99% of 450,000-strong electorate votes in U.N.-organised referendum, with 78% of voters favoring independence. Violence erupts as anti-independence militia helped by the Indonesian military resume campaign of terror, leaving up to 1,000 dead. A quarter of the population flees, mainly to West Timor. Martial law imposed. Australian-led peacekeeping force arrives, gradually restores order. Many militia members flee to West Timor to avoid arrest. Indonesian parliament recognises outcome of referendum. U.N. Transitional Administration in East Timor (UNTAET) established. 2000: Australia and the UNTAET sign memorandum of understanding over future revenues from Timor Sea oil, gas fields, renaming the ZOC as a Joint Petroleum Development Area; continues 50-50 revenue split from earlier treaties with Indonesia. 2001: UNTAET and Timorese Prime Minister Mari Alkatiri sign the Timor Sea Arrangement with Australia, which increases East Timor's share of upstream oil and gas revenues from the JPDA to 90%. 2002: March Australia secretly withdraws from international processes for resolving maritime boundary disputes under UNCLOS and the International Court of Justice. 20 May: East Timor gains complete independence. Australia and East Timor sign the Timor Sea Treaty to replace the 2001 Timor Sea Arrangement, with similar terms. 2003: January: The East Timor Action Network demonstrates in Washington to demand that Australia abide by international law, the first of many such demonstrations over the next 2� years. 2004:	Production at Bayu Undan gas field begins; project is expected to earn $100m a year. Launch of new campaigns to protest Australia's theft of East Timor's resources: the Timor Sea Justice Campaign in Australia and the Movement against the Occupation of the Timor Sea in East Timor. 2006: January: Australia and East Timor sign the Treaty on Certain Maritime Arrangements in the Timor Sea (CMATS), raising Timor's share of revenues from Greater Sunrise from 18% to 50% but pushing determination of a permanent maritime boundary from 30 to 50 years into the future. Report on alleged atrocities during Indonesia's 24-year rule is presented to the U.N. It finds that the occupation was directly responsible for the deaths of more than 100,000 East Timorese. Sources: BBC News, "Timeline: East Timor," May 2006; La'o Hamutuk Bulletin, April 2006. In December 1975 Indonesia invaded and occupied East Timor, nine days after the nation of 600,000 had declared its independence from Portugal. Indonesia's brutal occupation lasted for 24 years and took the lives of an estimated one-third of Timor's population. Following an August 1999 referendum in which the Timorese voted overwhelmingly for independence, Indonesian and Indonesia-backed militias rampaged across the country, killing more than 1,000, displacing 75% of the population, and destroying Timor's entire electrical grid, three-fourths of its buildings, and most of its other infrastructure. Beginning in late 1999, a United Nations-led international peacekeeping force brought calm, and Timor achieved full independence in May 2002. But the new nation has struggled to rebuild and develop. Timor's 2004 GDP amounted to about $370 million, or $400 per capita. Overall, the country ranked 140 out of 177 on the U.N. Development Program's human development index in 2005, placing it just above Sudan, the Congo, and Zimbabwe. Timor is highly dependent on international aid: as of 2003 the country had received the largest quantity of overseas aid per capita of any post-conflict society. Moreover, this does not include the budgets of the several U.N. missions that have operated in Timor since 1999. Overall, these total aid inflows nearly equal the average annual GDP from the non-petroleum sector of the economy. At the same time, Timor has become highly import dependent. In 2004, for example, its exports were just $7 million, almost all coffee. The same year, the country imported $113 million worth of goods. Ironically, nearly a third of the imports were fossil fuels. The government originally projected a budget shortfall of $126 million for 2005 to 2007, bringing with it the prospect of falling into debt to international financial institutions. The fiscal outlook has recently brightened, but it remains worrying. Given these difficulties, control over Timor's gas and oil resources is crucial to its prospects for forging an independent path of development. The Timor Gap lies well inside the line halfway across the Timor Sea separating the two countries—the line that, under the terms of the UNCLOS, would likely mark the proper permanent maritime boundary between the two countries. The only western country to recognize Indonesia's 1975 annexation of East Timor, Australia began further negotiations with Indonesia in the late 1970s to try to "close" the "gap." These talks failed; eventually, the two countries agreed to drop the boundary issue and instead simply negotiate a plan for petroleum development. In 1989 they signed the Timor Gap Treaty, which rechristened the area a "Zone of Cooperation" (ZOC): the two countries agreed to split revenues from joint petroleum exploration operations in the gap equally. The 1989 treaty ignored not only the median line principle for determining maritime boundaries, but Timor's status as an illegally annexed and occupied territory as well. Greater Sunrise, the largest of the four fields at the center of the current dispute, was discovered in 1974. Only 20% of its geographical area falls inside of the ZOC. The remaining three fields were all discovered in the mid- to late-1990's. Bayu-Undan, the next largest, and Elang-Kakatua are both located entirely within the ZOC. Laminaria-Corallina is located closer to East Timor's shoreline but falls just outside of the ZOC (though some geologists believe its reservoir extends into the ZOC). For this reason, if Australia manages to continue imposing the terms of its bilateral treaties with Indonesia on East Timor, Timor will receive none of the field's revenues. Revenue distribution for the other three main fields is somewhat more equitable but still extremely problematic. And Australia has tended to cast any shift in revenue arrangements as a "concession" on its part. For example, as a consequence of sustained international pressure, under the January 2006 Certain Maritime Arrangements in the Timor Sea (or CMATS) agreement, one that's been hailed as something of a breakthrough, revenues from Greater Sunrise are to be divided equally once production begins in a few years (under a license that has already been assigned to an Australian company, Woodside Petroleum). Prior to this "breakthrough," the Australian government had long insisted that it would concede only 18% of the revenue from the field to Timor, in proportion with the portion of Greater Sunrise lying within the ZOC. But even though the new agreement reflects a significant victory for East Timor—as well as a testament to the force of ongoing pressure campaigns on Australia—the 50-50 split remains a far cry from the full 100% of the Sunrise revenues that Timor would be assigned under a median line principle for settling a permanent maritime boundary with Australia. (The January agreement covers only upstream revenues, in other words, resource extraction and transfer into a pipeline or sea vessel. The distribution of downstream revenues from Sunrise, i.e., processing activities such as refining, remains a major outstanding issue.) Under CMATS, revenue flows from the other two fields at issue, Elang-Kakatua and Bayu-Undan, are subject to a distribution scheme in which Au stralia will retain all earnings from downstream processing activities (for the gas) and 10% of revenues from upstream extraction (for oil and gas), with the other 90% of upstream earnings going to East Timor. 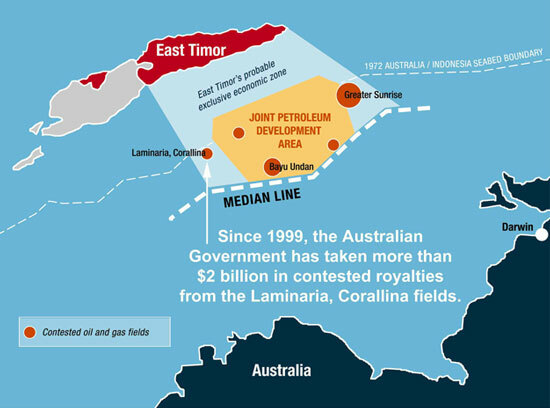 The $1 billion Australia has received in revenues from just the Laminaria-Corallina fields since 1999 is several times the amount of development aid Australia has provided to East Timor in the same period, and on account of which it has received and given itself great acclaim. In 2003 alone, revenue from Laminaria-Corallina came to $172 million, nearly twice as much as the Timorese government's budget for that year. Once the Greater Sunrise field comes into production, it is projected to yield as much as $40 billion in revenue over its lifetime; under CMATS Timor is due to receive only half of this amount. Under the terms of UNCLOS, the median line between two nations should be their presumed boundary (see "The Law of the Sea: A Brief Primer"). In the case of the Timor Sea, however, Australia claims that its maritime boundaries with Timor are to be settled according to the geomorphology of the seabed—the outdated continental shelf principle. And, naturally, Australia maintains that its own continental shelf is especially elongated, extending all the way up to the so-called Timor Trough, approximately 40 nautical miles from Timor's shores. (The point is one on which geologists have disagreed.) Indonesia's 1971 seabed boundary treaties with Australia reflect this view, placing the boundary line just south of the Timor Trough, about 80 nautical miles north of the median line. Given the legal framework of UNCLOS, Australia's position is remarkable: its demand is for nothing less than to be allowed to claim nearly all of the 238-nautical-mile span between it and Timor as its own. It is not surprising, then, that Australia has sought to avoid serious scrutiny of its claim under international law. In March 2002, the country announced that it would be exercising its option to withdraw from the jurisdiction of the International Court of Justice over disputes concerning resource exploitation in disputed areas and from the jurisdiction of UNCLOS' International Tribunal for the Law of the Sea over disputes concerning maritime boundaries. This decision came only two months before the end of East Timor's supervision by the U.N. Transitional Administration; at that point, as a fully independent and sovereign state, it would have been much closer to achieving standing to bring such maritime disputes in both venues. Since 1999, Australia has been able to defer the issue of settling a permanent maritime boundary by instead focusing on "interim agreements" that seek to transfer the machinery of the previous bilateral treaty framework with Indonesia onto independent East Timor. The July 2001 Timor Sea Arrangement, negotiated while the United Nations was still overseeing Timor's transition to independence, began the process of re-legitimating the 1989 Timor Gap Treaty—a tainted pact, after all, negotiated with an occupying power whose sovereignty over the territory at issue had been recognized by almost no one other than Australia itself. In the 2001 arrangement, Australia sought to wash away this sullied history, primarily by re-christening the ZOC as a "Joint Petroleum Development Area" (JPDA) and by setting out a new, ostensibly more generous revenue split giving Timor 90% of upstream oil and gas revenues from activities in the JPDA. In 2002, only 12 hours after achieving full sovereignty, the Timorese government agreed to a new Timor Sea Treaty essentially identical to the 2001 arrangement (and effectively negotiated by the U.N. transitional administration). The 2002 treaty again put off the matter of a permanent maritime boundary; at the same time, it set up a 30-year development authority for projects in the JPDA. The Timorese government faced significant domestic criticism for signing the 2002 treaty. However, this criticism had more to do with strategy than with underlying goals, according to Charles Scheiner, a researcher with La'o Hamutuk/The Institute for Reconstruction Monitoring and Analysis, a civil society group that promotes transparency and public participation in the country's development. "It was made clear to the Timorese government that if it were not to sign the treaty, the much-needed revenues it would soon begin receiving from the Bayu-Undan field could be delayed indefinitely," he notes. Civil society and development groups wanted to keep up the fight for full independence, including fair and permanent maritime boundaries, but the government, under then-Prime Minister Mari Alkatiri, was more worried about meeting its day-to-day need for revenue. Scheiner also views the recent opposition to Alkatiri, which led to his resignation this June, as largely unrelated to the domestic divisions over the country's maritime negotiations with Australia. In 1945, President Harry Truman unilaterally declared that the United States would henceforth be entitled to all natural resources within its continental shelves—the shallow areas just off the coasts, extending out to where the sea floor drops down sharply. In so doing, Truman began a movement away from the older "cannon shot" principle of maritime law, under which a nation's rights extended only six kilometers from its shores. But exactly where continental shelves end and the ocean floor begins is often a matter of dispute, and by the early 1970s the new continental-shelf principle was already giving rise to conflicts. In response, a U.N.-mediated process of rewriting maritime law accelerated until, in 1982, the U.N. Convention on the Law of the Sea (UNCLOS) was completed. The new convention came into full force in November 1994. Both Indonesia and Australia are signatories; East Timor has yet to sign. Under the convention, nations have full political and economic rights over the first 12 nautical miles from their shores, their "territorial waters," and partial rights over the next 12 nautical miles. The first 200 nautical miles are a so-called exclusive economic zone within which a nation has full rights to exploit marine and undersea resources. What if, as in the case of East Timor and Australia, two nations are less than 400 nautical miles apart? In such cases, UNCLOS mandates negotiations as the first step for sorting out overlapping claims to common sea areas and endorses the median line principle as the guiding norm for resolving such claims. Australia itself has recognized the median line principle, for instance, in an unratified 1997 treaty with Indonesia concerning the water column boundary (for fisheries rather than undersea resources) in the exact area of the Timor Sea now at issue. And in July 2004, Australia accepted the median line principle to settle its maritime boundary with New Zealand—although in this case the seabed area in question is not believed to have significant oil or gas reserves. In 2004, Timorese Foreign Minister Jose Ramos-Horta offered to give up Timor's rightful claim to a permanent maritime boundary until all petroleum reserves in the Timor Gap area were exhausted. In exchange, he sought Australia's agreement to provide a larger share of revenue from the disputed petroleum and gas fields. At the time the offer was met with little enthusiasm by Australian Foreign Minister Alexander Downer, though it now seems to underlie Australia's willingness to reapportion upstream revenues from Greater Sunrise gas as part of this year's CMATS agreement. While the greater share of Greater Sunrise revenues that CMATS gives Timor is welcome, in other respects the new agreement moves farther away from a just resolution. CMATS allows the settlement of a permanent boundary to be postponed for as long as 50 years, a significant jump over the Timor Sea Treaty's period of 30 years. As La'o Hamutuk notes, "[t]he 50 year duration appears to be based on commercial grounds, providing certainty for oil companies to explore and exploit petroleum resources without any changes of ownership until the oil and gas is used up." In fact, CMATS mandates that the parties cannot even so much as raise "in any international organization matters that are, directly or indirectly, relevant to maritime boundaries or delimitation in the Timor Sea" and that neither party is under any "obligation to negotiate permanent maritime boundaries for the period" of the treaty. The agreement prohibits the parties from seeking relevant legal remedies and stipulates that nearly all disputes are to be settled through "negotiation" and "consultation." Australia's superior bargaining power will likely allow it to prevail in any such negotiations or consultations. Given Australia's success at the negotiating table, by 2001 Timorese civil society groups began pressing to have Australia's revenues from resources falling on East Timor's side of the median line placed in trust until the boundary dispute is fully resolved. These calls have only continued in the wake of the CMATS, as has Australia's failure to respond to them in any way. Today, both the Timorese government and civil society and development groups find themselves at a crucial juncture. First, they must assess any possibility that remains for working toward a permanent maritime boundary in accord with UNCLOS principles and decide whether strategies should instead focus solely on achieving greater equity, within the "interim" framework, where outstanding issues remain (downstream revenues from Sunrise, for example). Second, this summer's civil strife has once again brought foreign troops—mainly Australian—into Timor. But Australia's assistance may have a price tag. Some observers fear that Australia might, for example, demand that Timor repay its peacekeeping expenditures or even renegotiate CMATS so as to roll back the partial gains that treaty offered Timor. Finally, even under the current treaty framework, within five years Timor will derive some 89% of its GDP and 94% of government revenues from oil and gas sales from Bayu-Undan alone, according to La'o Hamutuk's estimates. So even if Timor will not receive its fair share of oil and gas revenues, its dependence on the revenues it will receive will pose a complex series of challenges similar to those any petroleum-rich developing nation must face. There are good reasons that majorities in many poor but oil-rich countries have come to regard their oil as a curse. In many instances, these countries end up with worse corruption, more serious environmental hazards, slower economic development, and less investment in education and infrastructure than their resource-poor counterparts. Ensnared in the highly militarized geopolitics of the international oil business, they face the near-impossible challenge of managing their Big Oil corporate partners and the constant risk of oil-related intervention. In 2005, the Timorese government established a Petroleum Fund to hold oil and gas revenues for future investment; the fund has some $600 million in deposits to date. In addition, the legislature has passed the Petroleum Act, Petroleum Fund Act, and a model Production Sharing Contract (a template for the individual contracts to be signed with oil companies) to establish a regulatory framework for managing petroleum resources from Timor's mainland and exclusive waters as well as from the JPDA. The recent violence and political turmoil in Timor only heightens the import of all of these questions. Typically, the western press has framed the story as one of a power-hungry leader (former Prime Minister Alkatiri) losing his grip over a failed-state-in-the-making—a narrative that does not begin to capture the complexities of Timor's history and current circumstances. Labeled a "Marxist" and an "extremist" by some of his critics, Alkatiri appeared at times to follow an economic-nationalist path that met with disapproval from Australia and other powers. He expressed reluctance to completely accept the dominant neoliberal development paradigm, although precisely how much his policies reflected this reluctance is a matter of debate. Under Alkatiri, notes La'o Hamutuk's Scheiner, "the government modified its public approach to Australia to become closer to the popular movement's call for an end to the occupation of the Timor Sea." As the full story behind his recent ouster comes to light, these factors may well turn out to be a part of it. In any case, the connections between the recent upheaval and the general backdrop of unemployment and poverty that Timor Sea energy resources might be used to address are clear. If governments and activists continue to put pressure on Australia, whose ongoing appropriation of Timor's resources has been a principle cause of its current problems, the promise of the country's oil and gas wealth for beginning to meet people's needs and prevent further violence will only grow. But these resources need to be used properly to achieve genuine, equitable, and sustainable development. To these ends, the ongoing concern and understanding of Timor's situation by those outside its borders will be as important for its people as it has been throughout their country's recent and needlessly tragic history. Faisal Chaudhry, a member of the D&S collective, is a lawyer and Ph.D. candidate in history at Harvard University. He studies the historical relationship between colonial rule and the evolution of law and legal systems in parts of Asia and Africa, as well as contemporary trade, human rights, and development issues. Sources: The La'o Hamutuk Bulletin, Vol. 6, No. 4 (11/05) and Vol. 7, No. 1 (4/06), www.laohamutuk.org; East Timor and Indonesia Action Network, www.etan.org; Movement Against the Occupation of Timor, "Statement," April 2004, available at www.etan.org/news/2004/04move.htm; text of CMATS treaty, available at www.laohamutuk.org/Oil/Boundary/CMATStext.htm.